Fourth Row Center: Film Writings by Jason Bailey: On DVD: "It's Garry Shandling's Show: The Complete Series"
On DVD: "It's Garry Shandling's Show: The Complete Series"
At long last, the wait is over. Garry Shandling has been the star and driving force behind two of the most innovative comedies of the modern era, but for the last several years, neither show received the DVD treatment they deserved. His 1990s HBO series The Larry Sanders Show proved a non-starter on disc; we’ve seen only the first season thus far (though it’s been released twice) and the well-produced but (of course) incomplete Not Just the Best of the Larry Sanders Show. (The idea that they’re just sitting on the five remaining seasons while a full box set of the entire run of Full House is readily available boggles the mind.) But his earlier comedy “It’s Garry Shandling’s Show.” remained MIA in any form… until now. 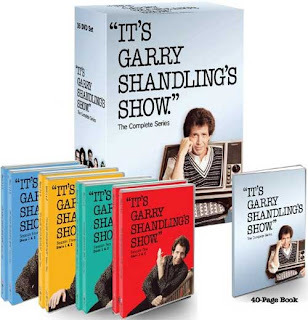 “It’s Garry Shandling’s Show.”: The Complete Series collects all 72 episodes from the show’s four seasons on Showtime (with re-runs later airing in the primetime line-up of the then-fledgling Fox network), and while it may not have been the most widely-seen comedy of the era (its stealthy audience was a frequent running joke on the show), it was certainly the most influential. The creative elements involved went on to become major players on several of the most critically praised (and frequently funny) shows of the years that followed, many of which share the show’s hip, smart sensibility and humor: the aforementioned Larry Sanders Show, The Simpsons, Seinfeld, and Curb Your Enthusiasm, among others. When “It’s Garry Shandling’s Show.” began, television comedy was formulaic to a fault; sitcoms used the same tired template and the same clichéd conventions, relying on cute kids and pat situations and an unending cycle of flat set-ups and easy pay-offs. Shandling and co-creator Alan Zweibel made the show fresh and new primarily by reaching further back into the history of television comedy, with a show that mimicked the presentational storytelling and personal, character-based comedy of Jack Benny while utilizing the ingenious fourth-wall breaking of his contemporary George Burns. Shandling plays “Garry Shandling” a neurotic comedian in his late 30s; the series begins with him moving into a new condo, where his neighbors include his “plutonic friend” (she’s always referred to as such), Nancy (Molly Cheek); his best friend, nebbish family man Pete Schumaker (Michael Tucci); and Pete’s son Grant (Scott Nemes) and wife Jackie (Bernadette Birkett). Garry’s mother Ruth (Barbara Cason) is a frequent visitor, as is his condo president, the insufferable Leonard Smith (Paul Willson), who drops in whenever possible in a blatant bid for more air time on Garry’s show. While both George Burns and Garry Shandling break the fourth wall by talking to the audience and acknowledging the fact that they’re on television (Burns would turn on the TV in his study to eavesdrop on scenes he wasn’t in, an idea expanded by Shandling), the primary difference is in the show’s overall self-awareness. Every character knows that they’re on Garry’s show and makes jokes to that effect, from little Grant making his first appearance at the end of an episode to complain scornfully, “Thanks for the big part in the show this week, Uncle Garry!” to Garry’s mother doing a spontaneous live commercial on the air in order to drum up business for her pet shop. The show also makes ingenious use of its studio audience—Garry prompts them to join in to shout “surprise” at his mother’s surprise party, hands out his winnings to them after a lottery jackpot, and, in a clever season three episode, takes the episode in a boring direction that prompts an audience walk-out. Perhaps the finest use of the studio audience comes in the second season episode “The Schumakers Go To Hollywood,” where Pete and Grant go on a trip to Tinseltown and wind up in Garry’s audience (Grant: “Hey, it’s my room!”). Generally speaking, the show’s first two seasons are its best. Season one finds Shandling, Zweibel, and the talented writing staff tinkering with television conventions like a kid playing with a new toy, trying new ideas and generally seeing what they can get away with. On “Fate” (penned by future Men In Black screenwriter Ed Solomon), Garry tries to stop the show to prevent Nancy from going on a bad date; he tells the audience, “We’ll stay here, we won’t go to scene four,” and then bides his time by putting on a square dancing instructional video. On “Garry Met a Girl Named Maria,” Garry finds out that one of the studio cleaning women is about to be deported; he contemplates a green card marriage, and goes out into the audience to get their opinion (he carries a handheld microphone and turns the whole thing into a Donahue/Oprah spoof). Most memorably, on “The Morning After,” Garry has to find out how his previous night’s party went wrong with the use of his handy “flashback booth” (“Yeah, it’s my flashback booth. Like you don’t have one!”). The show really hits its stride in season two, with the rules established and characters entrenched, and Shandling and the writers pushing the envelope even further. The season kicks off with the so-called “Name the Schmacher Baby Contest,” a real promotion in which viewers submitted names for Pete and Jackie’s gestating baby. “Nancy Gets Amnesia” is also a highlight (“All right, our first amnesia show!”), giving Molly Cheek the rare opportunity to give Nancy some extra layers; Jennifer Tilly guests on the two-part “Angelica” show, as Garry’s first real live-in girlfriend (the title and theme song change once she moves in); and the gang all pays a visit to “Shandling-Land,” Garry’s theme park (Grant: “Dad, am I old enough to go into Garry’s Haunted Bedroom?”). The Christmas episode is quite funny (“Hey, everybody, it’s Santa Claus!”) and the “Save the Planet” episode—and its revelations about Garry’s mom—is one of their silliest and most enjoyable. But three episodes from this, the show’s best season, stick out most. The second show of the season, “No Baby No Show,” begins with Garry excited (“This is a very special episode!”) because Jackie has agreed to give birth on the air. But when Jackie and Pete arrive and the baby isn’t coming yet, Garry’s stuck for what to do with the time; once neighbor Tom Petty arrives (“Hey, everybody, it’s Tom Petty!”), it slowly, subtly, and brilliantly morphs into an incredibly awkward talk show (shades of Larry Sanders), complete with a song by Petty, plenty of plugs, couch scooching, and Susan Anton. Perhaps the ballsiest single show of the entire run is “Garry Falls Down A Hole,” in which Garry misses his entrance because of, well, see the title; it begins on the empty set, and the first five minutes of the show is purely people wandering around looking for Garry, and the theme song playing (twice). It’s a rather exceptional bit of meta-comedy, an example of the show taking its premise right up to the edge, and then leaping over gleefully. For sheer enjoyment, however, it would be hard to top the “Mr. Smith Goes to Nam” episode, which features guest star Gilda Radner in her final TV appearance—and she’s wonderful, stealing looks into the camera, shamelessly soaking the audience for applause, and generally having a great time. She was so gifted, and clearly had so much more to give, that the episode’s only drawback is that it’s kind of heartbreaking. Season three finds the show refusing to rest on its laurels, puttering with its now-established format—starting the show in new locations, toying with the monologues, even sometimes (gasp) skipping the theme song, or playing it in new ways. It also includes the show’s only live episode (special coverage of the 1988 presidential election—“We’re live… because I don’t have enough godddamn stress in my life…”—with the help of special correspondent Don Cornelius) and an all-musical episode, done specifically for the entertainment of their special guest, Los Angeles mayor Tom Bradley (“I don’t know why he’s here, he only likes musical theatre”). Gimmicks like a live show and a musical episode would come to serve as red flags for shows jumping the shark, and to be sure, there are some clunkers in season three. The three-part “Save Mr. Peck’s” episode, in which Garry and his show-biz friends put on a benefit for the comedy club that gave him his start, is kind of a misfire; it parades out celebrities (and pseudo-celebrities) without finding much of anything interesting to do with them, aside from letting them do their acts. “The Natural,” an episode-length spoof of the Robert Redford film, wasn’t even timely when it first aired (four years after the film’s release), and shows that the weakest “Shandling’s Show” episodes are those that are most conventional—specifically (with the exception of the first season episode “The Graduate”) those that dabble simply in straight-forward parody. But there are also moments of brilliance (in the “Worry Wart” episode, Garry throws in a tape of a previous, unaired show, commenting and fast-forwarding throughout), and shades of things to come for Shandling. The “Big Brother” episode begins with Pete waking up Garry, who tells him, “It’s six a.m. The audience isn’t even here yet!” and sure enough, they’re not—there’s no laughs heard, and as Garry ends up wandering through the empty seats and reflecting on his own loneliness and neurosis, we get a glimpse of him moving towards the themes he would explore in greater depth—and with great success—on The Larry Sanders Show. Most fans remember season four as the “girlfriend season,” since it focused on his courtship and eventual marriage with Phoebe, played by Jessica Harper (who was immediately made a regular, which must have infuriated actors like Willson and Birkett who never made it, throughout the four seasons, into the opening credits). As an actor, Harper is likable as hell, but the trouble is that she’s not very funny—even when they writer her some decent lines. The idea of shaking up the show by giving Garry a continued romantic interest wasn’t a bad one, but Harper unfortunately doesn’t prove quite strong enough to tackle it. On the other hand, there are more appearances by the late, great Bruno Kirby, whose characterization of Gary’s manager Brad Brillnick is a perfect synthesis of yes-man and snake. And there are plenty of truly funny episodes; Andy Griffith Show fans will love “The Day Howard Moved In,” which features Jack Dodson as his Mayberry character, Howard Sprague, while “The Wedding Show” features a garish on-air wedding thrown by the network, complete with production numbers, dancers, and guest stars like Charles Nelson Reilly and Connie Stevens. “Shandling Vs. Mull,” with uproarious guest-star turns by Martin Mull and Joy Behar, is killer, as are the episodes dealing with Garry’s failed tour opening for Guns N Roses (specifically “Chester Gets a Show,” a clever satire of what was then the norm for TV comedy). And “The Family Man,” in which Gary and Phoebe take a home pregnancy test (the results take 23 minutes, “just enough time for a show”) makes ingenious use of a new prop, Gary’s “time flies clock,” which sends him into the future. In its last two years, “It’s Garry Shandling’s Show.” was still awfully funny, but became subtly less subversive and more conventional (as with the in-law shenanigans of “The Proposal”), less edgy and more goofy (as in the broad Hitchcock parodies of the “Nathan’s Sheer Madness” episode). But in even its weakest episode there are moments of greatness, whether it’s an inspired storytelling device (Gary’s “dream hat”), a throwaway bit of business (Gary stops a scene to ask, “Can we use the camera angle into the mirror? I think the scene will play much more dramatic”), or a well-utilized guest star (when Carl Reiner finds that he’s only getting “cold spaghetti and one little scene,” he picks up a phone and announces, “Think I’ll make some long distance phone calls!”). Some of the references are dated and some of the links in the supporting cast are weak, yes. But those flaws don’t add up to much. “It’s Garry Shandling’s Show.” was an innovator, and the best comedies of the intervening years owe much to it, both in terms of style and format (the influence on Seinfeld is particularly obvious, from the broad outlines down to several parallel characters: Nancy and Elaine, Pete and George, Leonard Smith and Newman, etc.). It was a series that showed how inventive TV comedy could be, as long as its creators were willing to think outside that square box. Though there is a noticeable drop in quality between first two seasons and the last two, “It’s Garry Shandling’s Show.” more than earns its reputation as one of the great comedy shows of the modern era. The price tag for The Complete Series is a hefty one, but for those who are serious about their comedy, it is a must-have. "'It's Garry Shandling's Show. ': The Complete Series" hits DVD on Tuesday, October 20th. For full details on audio/video quality and bonus features, read this review on DVD Talk.